Ingo De Jong Shihan was recently graded to 8th Dan Hanshi. He is the Eurpoean Director of the International Karate do Goju Kai Association I.K.G.A. and a world Vice President of the organisation. 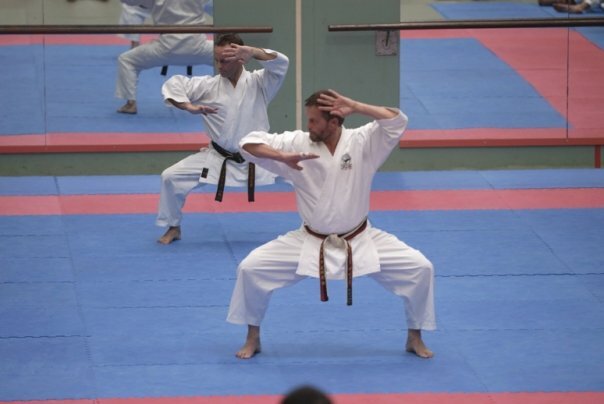 Ingo Shihan is an Australian citizen of Dutch-German heritage, however he spends the majority of his time in Sweden and travelling throughout Europe lecturing and delivering seminars to the IKGA branch Dojo throughout the various countries within the European Division. Ingo Shihan commenced training in Sydney Australia during the early 1970's with Paul Starling Shihan at his North Sydney Dojo of Sydney Goju Kan. He was amongst the group of Sydney Goju Kai Brown belt students along with Mark Burton, assisting seniors who at that time kept the classes running throughout Paul's year long absence from Australia whilst he was attending the Shihan Master course at the Japan Karate do College of Gogen Yamaguchi. On Paul Starling Shihan's return to Australia in 1973 the future Master -Ingo de Jong was promoted to Shodan Ho following on from Paul's 1st batch of shodan black belt student qualifiers in 1972: Helmut Moldners, Michael Yates, Peter Kirkwood and Ross Turner. 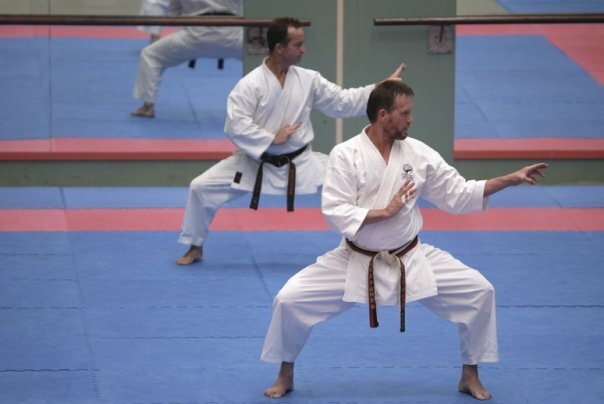 Ingo de Jong (Hanshi) & Mark Burton (Renshi) demonstrating Genkaku Kata at Macquarie University in Sydney in 2008. They both first commenced training with Paul Starling here in circa 1970 ; 38 years previously! Ingo Shihan had prior Judo experience before commencing Goju Kai Karate Do at the Sydney Goju Kan Dojo of Shihan Paul Starling in 1970. Right away it was obvious that he would be a fearsome fighter, with an athletic body, flexibility, explosive reactions, aggression, and focus. Even as a Green Belt, he would visit other Styles of Karate and engage in fierce combat with their Black Belts. Prior to eventually settling down in Sweden, Ingo Shihan lived in a Kibutz in Israel, teaching and training in Karate, Unarmed Combat, and Self Defence. He also spent some time in Thailand, where he trained in Muay Thai Kick Boxing, as well as fighting the local practitioners. On arrival in Europe, he competed in Non Contact, Semi Contact, and Full Contact Karate competitions, in one competition in Germany, winning all three divisions in the one day. He made many International life long friends from these Tournament years, including such well known Instructors as Shihans Howard Collins and Brian Fitkin from Kyokushinkai. Ironically, these days, the former 'Tough Guy' of Kumite Competition is known for his beautiful and graceful Kata performances, especially the Master Kata of Genkaku and Chikaku. These have been performed in front of spellbound audiances at numerous European IKGA Summer Camps and IKGA European Championships. 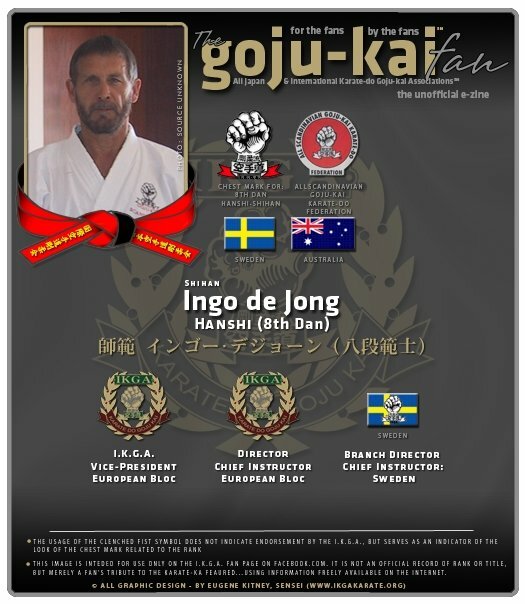 From humble beginnings in the Sydney Goju Kan Dojo, he has gone on to become Swedish Branch Chief, Director of Scandinavian IKGA, European IKGA Bloc Director, World Vice President of the IKGA, and recently awarded 8th Dan Hanshi. 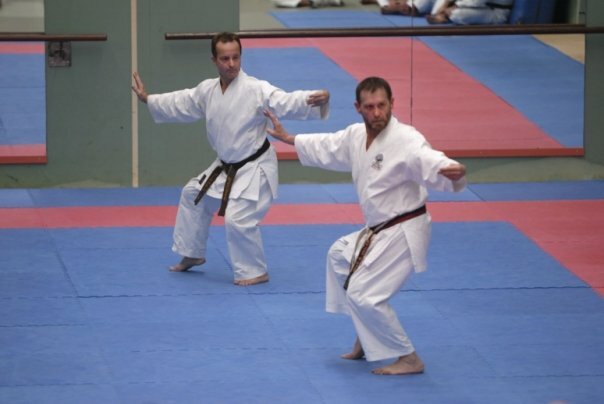 Ingo Shihan to this day, maintains a strong connection with his former teacher Paul Starling Shihan and the Sydney Goju Kan Dojo of IKGA. Photos by James Modzelewski of Macquarie University Club.